Travel options for businesses have never been more varied and plentiful than they are today. While special corporate rates and added amenities may be offered by many modern commercial airlines, the real growing trend in business travel is ownership of a corporate jet. There are several ways to manage jet ownership: Private Jet Ownership, Fractional Jet Ownership, Pre-Paid Jet Cards, Membership Based Programs, and Private Jet Charter. Each have their own pros and cons but, in the end, Private Jet Charter comes out to be the clear winner. Private Jet Ownership is the ultimate in luxury travel. You are beholden to no one when it comes to setting your flight schedule, you never have to share the aircraft, and it’s available whenever and wherever you want. The only drawback, as you might’ve guessed, is an exorbitant (and usually prohibitive) price tag. Even if you can afford the initial costs, simply maintaining the jet and keeping a pilot on call can be both expensive and a bit of a hassle. 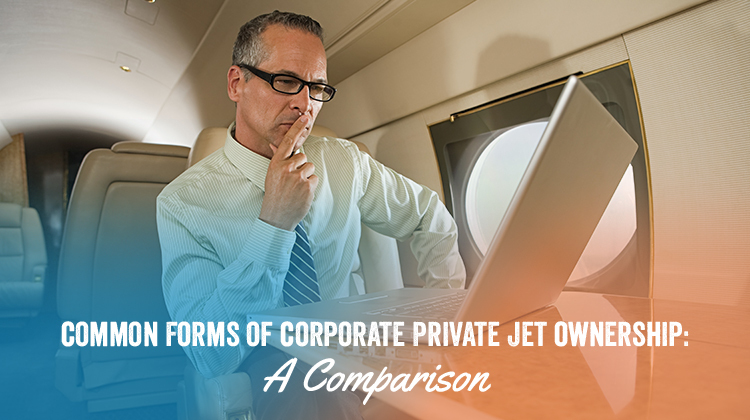 Fractional Jet Ownership is one way to address the particular pain points of Private Jet Ownership. In this arrangement, you own a portion of the jet and are therefore entitled to a set amount of flight time each year. This type of ownership ends up costing the purchaser significantly less than buying the jet outright. A lower price tag is traded for slightly more inconvenience. As only a partial owner, you’ll have to arrange flight times in advance and won’t be able to simply fly across the country on a whim. After all, the other owners will want to use the plane, too. Pre-Paid Jet Cards are an even more cost-effective way to ensure you have access to a certain number of flight hours than Fractional Jet Ownership. These cards, like the calling cards of the past, simply let you purchase flight hours and use them on a range of aircraft in a company’s fleet. This offers a level of flexibility to travelers in that they are able to actually choose the aircraft model they’ll be flying in. The disadvantages of this type of ownership is that the purchase flight hours typically run higher than Fractional and Private Jet Ownership. One benefit of actual ownership is the cost of flight hours gets smaller every time you use the plane. But with Pre-Paid Jet Cards, that price always stays the same. Beyond that, the call out period to request a plane is typically much longer than with other ownership types. Membership Based Programs are another alternative to jet ownership. They typically give users access to a range of flight options like ride-sharing and private flights in exchange for a yearly or monthly fee along with an initiation fee. Given the perfect circumstances, this can end up saving you a lot on travel expenses down the line. The drawback, however, is that finding flights to match your schedule, ideal flight times, chosen departure location, and desired destination is like finding a needle in a haystack. And when you are trying to plan a vacation, visit home, or attend a business meeting, leaving how and when you arrive up to chance is simply too difficult to manage. Plus, limited destinations can make it hard to get reasonable value out of the (typically sky-high) recurring membership fees. Private Jet Chartering is undoubtedly the most cost-effective and flexible option for the modern traveler. It lets you secure your travel plans while paying only a fraction of some of the other options. It also gives you access to a variety of aircraft so you can tailor your jet to meet your needs. And there are no membership fees involved, so you can use it as much or as little as you please. The only drawback? You can’t tell your friends you own a jet. But hey, it’s the next best thing! For more information about private jet charter, or to book your private jet today, download our mobile app or contact Jettly now. We’re your source for easy air travel that works around your schedule.